When fourteen-year-old Joan Skraggs’ mother dies, Joan must leave school and remain at home to tend to the house and farm for her brothers and father in Pennsylvania. Devastated at leaving her beloved teacher Miss Chandler and Miss Chandler’s library of books, Joan finds some comfort in the beautiful journal that Miss Chandler gives to her. Joan promises to write in her journal “with truth and refinement.” Thus begins her journal in the summer in 1911. Unfortunately, truth and refinement are challenging to find when she is cleaning the house, cooking the meals, and tending the farm; her brothers and father view her as servant more than a daughter and scoff at her interest in books and learning. Joan dreams of being a hired girl; where she might wear clean clothing, earn six dollars a week, be able to purchase books of her own, and have a future far away from the monotony and servitude of her current situation. When her father frightens off Miss Chandler who has come to visit, Joan chooses to strike in an effort to earn some small amount of money for herself. This exercise proves disastrous and when Joan’s father does the unthinkable, she has no choice but to run. Life in Philadelphia is a far cry from the muck and dirt of the farm, but there are still dangers. Through a somewhat comic but heart-wrenching ordeal, Joan is able to find a place in the home of a Jewish family. Although her own faith is Catholic, Joan strives to find her way in the world and become the woman her mother had always hoped she would be. What a magnificent story! 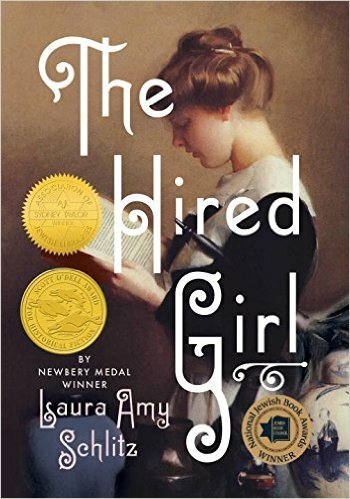 Author Laura Amy Schlitz won a Newbery Medal for her book Good Master! Sweet Ladies! Voices from a Medieval Village, which is also fantastic. The details about Jewish life in the early 20th century add so much depth to the story and contrasts with Joan’s innocent look at her own faith. The lessons and acceptance that she learns resonate in our own current society. But religion and faith are just a small part of this story. Through the details about early 20th century life and beliefs told from a young girl’s perspective, the reader truly gets a sense of her growing up and facing both the joys and heartaches of life. The author was inspired to write this book by her own grandmother’s journal and the reader can see it is a labor of love. The novel is written in journal form, but with more structure and depth than is sometimes seen in modern journal writing. The other fascinating part of the book is that each major section of the journal has a coversheet with a work of art and the title of the artwork is the title of the chapter. I think this would be a fascinating novel to teach and to meld the story with the history of the time period and an analysis of the artwork. What a great writing assignment for students to choose a piece of art that represents a time in their own lives. Although technically a young adult book, this novel really can be appreciated at all ages. I think it would be a wonderful book to use in a book group with members of different backgrounds. Followers of the Jewish faith and followers of the Catholic faith could reflect on the prejudices, stereotypes, and commonalities of the two religions. Grandmothers and granddaughters could discuss how different and similar the hardships and dreams are of both the past and present. A wonderful, entertaining, and inspiring read! This entry was posted in Young Adult Fiction and tagged Good Master! Sweet Ladies! Voices from a Medieval Villiage, Jewish faith, journal writing, Laura Amy Schlitz, Pennsylvania, The Hired Girl, young adult fiction on October 10, 2016 by kvgaughan.